Every year, I make my precious little Stella, my only grandchild (who will turn five right after Christmas! ), a really special ornament. I hope she treasures these ornaments as she gets older and realizes how much love her grandma put into each and every one of them. This year, I decided to go with a snowman theme. I have worked the two snowmen from Snow Much Fun to the bone (uh, do snowmen have bones?? ), so decided to give them a little break, and veer towards some of the smaller of Stampin' Up! 's recent snowmen (most of which are, alas, retired). I stamped 20 of the snowman in Black StazOn on white card stock. 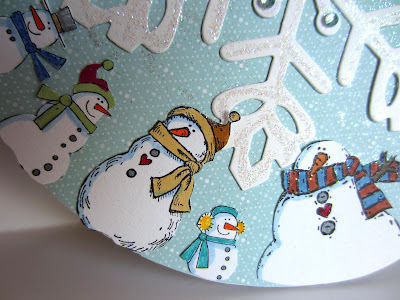 I then used a variety of Stampin' Write Markers to give them a little color. My next step was to cut each one of these cuties out. Once that was done, I placed them on the outer edges of a six-inch chipboard circle just to make sure they all fit nicely. I glued a piece of retired Designer Series Paper to cover the chipboard. 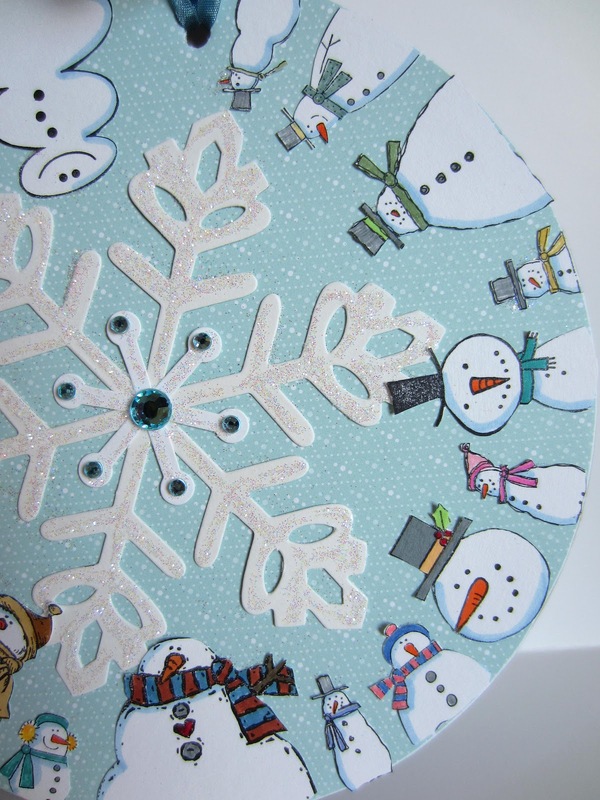 A snowflake came into being using the old retired four-inch die in my Big Shot, and was affixed to the center of the DSP-covered circle. 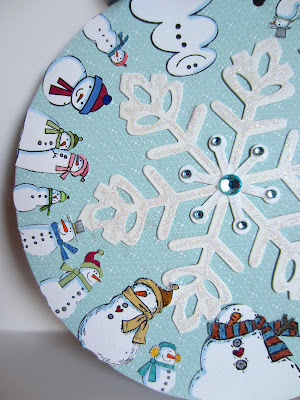 I then adhered all the snowmen around the edge of the circle, a few of them overlapping bits of the snowflake here and there. Hmmm. A little drab. So I added Dazzling Diamonds to the snowflake along with a few turquoise rhinestones to add that necessary bling for a five-year-old. I tied a silky turquoise ribbon at the top for a hanger. Doesn't Stampin' Up! make just the cutest snowmen?? I love 'em! I hope Stella likes her ornament for 2012. That is so cute! I know Stella will love them. It's hard to believe she's going to be five! This one is a lot of fun. Have a wonderful Christmas. Thanks for linking up! Cute!! I found you on 4youwithlove where I was featured too. 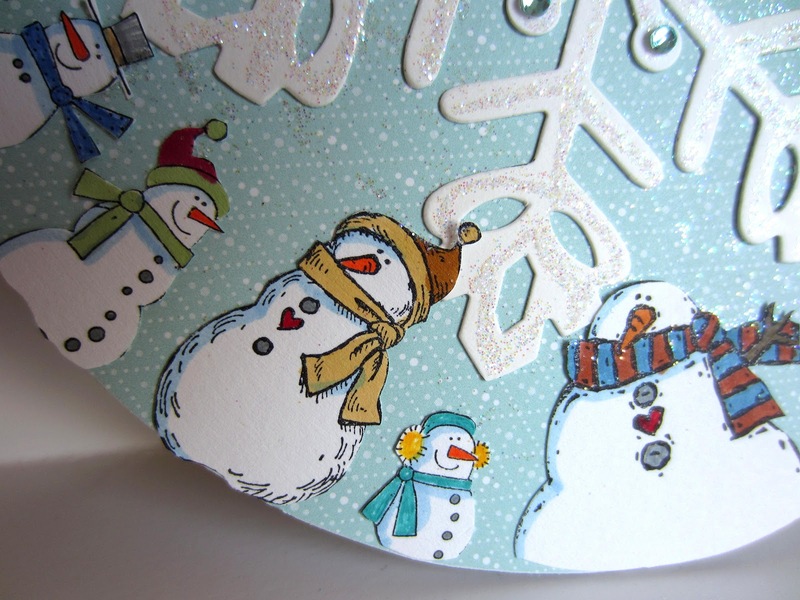 Love, Love this snowman ornament.I found you on 4youwithlove where I was also featured. Your granddaughter will love it. Happy Holidays. That is so adorable! 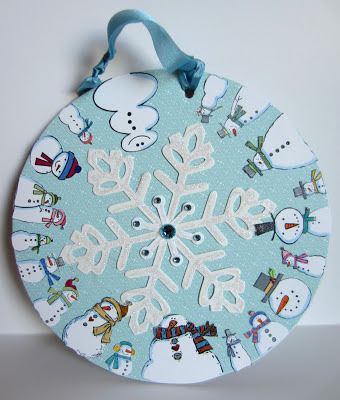 Thank you so much for sharing it at SHOW-licious Craft Showcase! I love it! What a gorgeous little ornament - I'm sure your granddaughter must love it!